Thanks to Dr. Semir Vranic, Clinical Center of the University of Sarajevo (Bosnia), for contributing this case. To contribute a Case of the Week, follow the guidelines on our Case of the Week page. (1) Do you want to motivate students from Detroit to be the best they can be? PathologyOutlines.com sponsors a charity, The Detroit College Promise, which provides scholarships to Detroit students simply for living in Detroit, attending a Detroit Public School, and taking a pledge. To date, over 20,000 students have registered. 100% of all funds contributed are used for scholarships, because PathologyOutlines.com covers all the overhead (even credit card fees). Click here to contribute or for more information. (2) We continue to have record website traffic, with 16,190 visits on 13 December 2011. Please continue to let us know what we can do to make our website more useful to you. (3) We are currently updating these chapters: CD Markers, Drugs of interest to pathologists, Kidney tumor-cysts, children, adult benign, Placenta and Stains. (4) Dr. Pernick has posted a research paper, The Laws of Complexity and Self-organization: A Framework for Understanding Neoplasia. This is based on an exciting new view of biology developed by Dr. Stuart Kauffman, the winner of a MacArthur Fellowship. Your comments are welcome to NatPernick@hotmail.com. 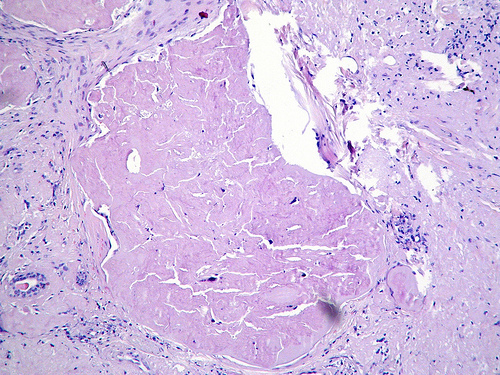 A 60 year old woman with no history of malignancy, kidney disease or other medical disorders presented with a tumor mass in the upper outer quadrant of her left breast measuring 30x25 mm. 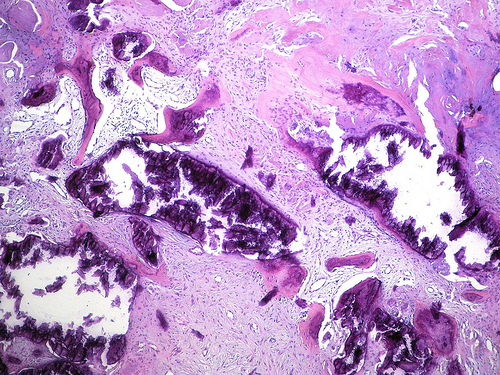 Previous mammography revealed massive calcification with a benign appearance. A wide excision was performed. Frozen section revealed no definite diagnosis. 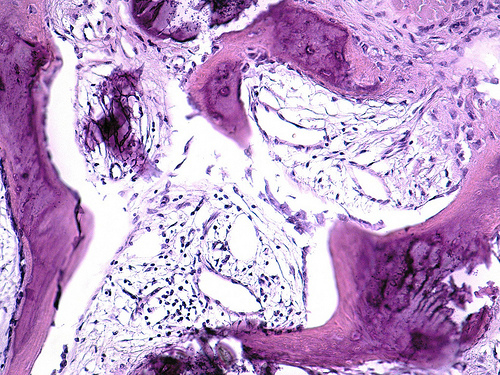 The specimen contains well-formed bone tissue without associated neoplasia. 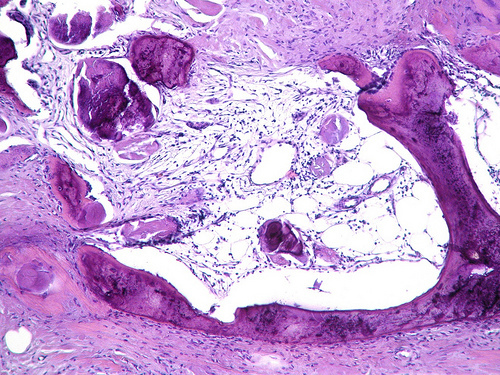 Osseous metaplasia is uncommon. 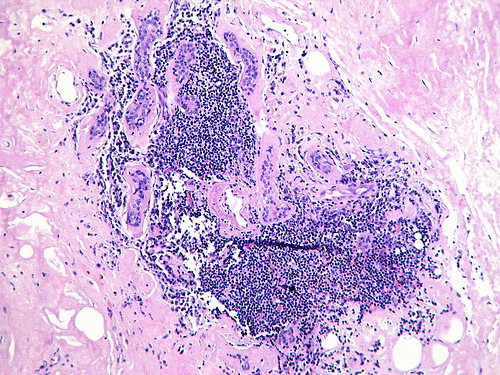 It is associated with benign lesions, including cholesterol granuloma (Pathol Res Pract 2008;204:353), fibroadenoma (Radiology 1989;172:671), fasciitis ossificans (Pathol Res Pract 2007;203:737, Arch Pathol Lab Med 2004;128:e29), lipogranuloma (Yonsei Med J 2011;52:373), radiation therapy (Br J Radiol 2002;75:460), saline implants (Plast Reconstr Surg 2001;107:356) and silicone implants (Ann Plast Surg 1998;41:348). 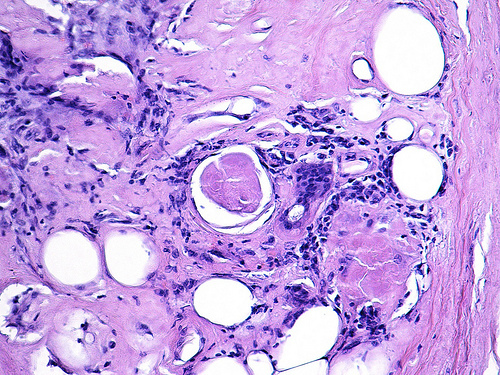 Osseous metaplasia is also associated with metaplastic carcinoma and other invasive subtypes (Breast 2008;17:314, Am J Surg Pathol 2009;33:534), as well as osteosarcoma of the breast (Cases J 2008 Aug 9;1(1):80). This disorder is benign, but it is important to exclude a possible associated malignancy, which may not be evident on a core biopsy.